IPE End Grain: What’s Wrong with this Picture? A picture is said to be worth a thousand words. In this case, it is definitely worth a few IPE questions. Here’s a short case study that captures some of the most common questions about IPE end grain and joints, and best installation practices for longevity. 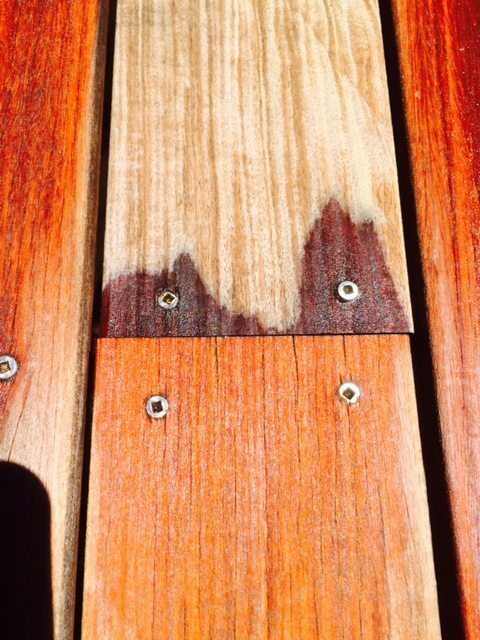 First, when the decking was installed, it was screwed through the faces of the boards instead of using a blind clip system which would leave no exposed fasteners. Perfectly functional, but as a point of style, not the most desirable method. Worse, it is obvious that the screws were not counter bored. Counter boring is the use of a special bit that creates a pilot hole for the screw and also a small semi oval pocket for the screw head to settle into, so the head is slightly recessed below the wood surface. Still visible, but a cleaner, more professional way to fasten. And certainly superior from a functional standpoint.